According to the Evening Standard, the line started forming as early as 8 a.m. (the pop-up opened at 11 a.m.). One person estimated that about 300 hungry people were in line before noontime. Vice&apos;s Munchies went out there to talk to some of the (prospective) patrons. They noted that the line was comprised of a lot of U.S. expats. "I&apos;m from San Diego so this just reminds me of home, basically," said one California native. "I&apos;ve lived out here for ten years, and every time I go home this is my first stop." There were a lot of true-blue Londoners, too. And it seemed that most of them knew the lingo. A few of them told Munchies that they were gearing up for a double-double, animal style. One person, however, was a little lost in the mist. "I&apos;m getting an Animal Burger," she said. "Which I believe is with extra relish." One bit of notable detail: Instead of the usual french-fries, patrons were served "crisps," which were basically potato chips. That&apos;s a little weird. Here are some images from the line. They really make you feel glad to be a Californian. A wristband guaranteed you a burger as long as you stayed in line. Apparently, this guy got the last one. He&apos;s like the Charlie Bucket of burger joints. 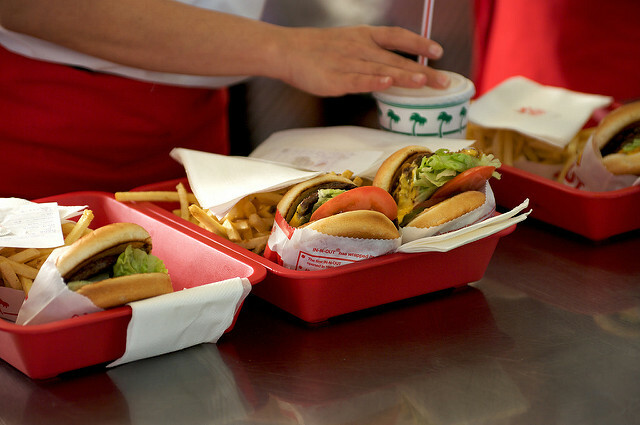 Market Watch believes that there&apos;s a possibility of a permanent In-N-Out coming to London. We hate to break it to our international friends, but that&apos;s probably not happening anytime soon, as In-N-Out is notorious for resisting the urge to franchise.